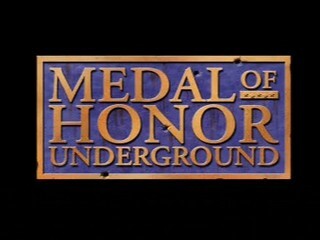 Released in 2000 for the Playstation, Medal of Honor: Underground is the prequel to the original Medal of Honor. Players take the role of Manon Batiste, a French Resistance soldier who is later recruited by the OSS and embarks on missions across Europe. Highlights include more complex and nonlinear level design. Best time on Easy difficulty: 1:00:29 by Carsten 'djcj' Janssen on 2012-08-10, done in 27 segments. Bloopers file available here. The game's engine of Medal of Honor Underground is the same as in the first Medal of Honor game. That means I can use all the tricks from the previous speedrun here too, like strafe-running or clipping. But there are also many differences between the two games. Underground is more difficult, the levels have more enemies and objectives and their design is often not as linear as in the predecessor. And in this game you can decide between three difficulties. I've done the run on easy difficulty, which is, unlike in most other games, the standard difficulty and comparable to the skill in the first game. This game is made of 8 missions with 3-4 levels each and a total count of 27 levels. Weapons and ammunition are carried over to the next level of a mission but never to the next mission. You can always start every level you have completed from the menu. The weapons and ammunition you've completed level A with will be saved, so you will always start level B with the same ammunition unless you restart and complete level A. That means you can run missions independently from each other and you can always re-run the last level of a mission. And a game can only be saved after a level is completed. That said, I have completed the segments in this particular order: 1, 5-7, 2-4, 8-13, 15-17, 21-23, 18-20, 24, 14, 25-27. Furthermore on easy setting you will start each level with full health, so there's no need to worry about health inconsistencies. On medium you will start with a minimum of 50% (unless you've left the previous level with more health) and on hard difficulty the health won't be refilled at all. In fact you can even start a level with 0% health by performing a certain trick on hard skill. You might wonder why there's no loading before a level starts. It takes a lot of time for a level to load once, but after it did and you die, the level restarts immediately. So whenever I die I can start again in one second. And if I made a mistake I can just kill myself, which has the same effect as a quick level reset function in some other games. Something else I want to explain is that the console is often not able to load things like enemies, parts of the environment or whole areas of a level fast enough or it doesn't load them at all. Sometimes that's a convenient thing, sometimes it doesn't matter and sometimes it even ruins attempts. Clipping: To be able to clip you need a part of your body to be half-stuck inside a structure. There are several ways to do that. Stay on top of a structure that has an edge which goes down in a 90° angle (like a wall or something comparable). Stay on the edge with the wall vertically to you, so that one leg is on the wall and the other in the air. Strafe towards the air-side. When you fall down one half of your body will be inside the wall. But on some places it's even easier. Sometimes parts of the environment push you against a wall, like in segment 1, and sometimes a wall doesn't even seem to be solid and you can just walk against it. After you did that and one half of your body is stuck inside the wall, you strafe into the walls direction and hold the button and then rapidly press the aim-button again and again. You will move through walls or out-of-bounds areas. But it's a bit slow, so there are many places where this trick is useless. Vent-clipping: Almost the same as normal clipping. Duck, crouch just a few centimeters into a vent and then stand up. The upper half of your body will be inside the structure around the vent but your legs will still be in-bounds. That means you can walk at normal speed through vents. However, there are some vents where this trick doesn't work. "Looking up/down" trick: If you look up or down enemies with a high accuracy will hit you less or even almost at all. I'm using this trick on especially the last two levels and in a light variant in segment 19 and 21. But it won't be useful in most other levels because it won't give you any advantage against less dangerous enemies and navigating while looking against the roof or floor is very difficult. I've been wondering how this trick might work and I came to the following conclusion: there must be a spot where the enemies are programmed to aim on, probably my chest or head. If I look as far up/down as I can, I'm bowing my body but that spot will remain where it is. That means it is now in mid-air, and strong enemies with a high accuracy will miss me with a 99% chance while low accurate enemies will still hit me a lot with their "missing shots". But this is just theory and should be checked by a TASer. This out of bounds clipping glitch saves roughly 30-40 seconds compared to the in-bounds method. Otherwise I have to wait until Jacques opened two doors for me which takes a lot of time. As for Jacques, normally if you don't protect him soldiers are trying to kill him, but if you run far away from him he seems to be able to take care of himself. That's why he didn't die when I left him alone. In this level you can get stuck at pretty much every corner. 1:10 - I'm not strafe-running but walking straight forward towards the ladder, because if you don't grab it right in the middle it'll push you away. 1:50 - I'm sorry for stopping for a moment. I wanted to make sure to not fall off the grave. This wasn't necessary but many of my attempts were ruined here. There's a way to clip through the fence that I'm looking at at 2:00. But it's difficult to perform and doesn't save any time at all. You don't have to use the stationary machine guns, just open the boxes and the game will mark them as "found". But two of them are placed right in front of the trucks that I have to destroy and therefore it's faster and more reliable to shoot them instead of using Molotov cocktails. 0:36 - It's possible to clip through the vent but I decided to not do it since it saves only 1 or 2 seconds and clipping into the wall is sometimes quite difficult. There are several places in this game where I decided to not perform one of these "vent" clipping tricks if it saves only 1 or 2 seconds. 0:45 - Clipping through the fence is very easy. The telephone mast pushes you through the fence if you walk against it. How many bazooka shells you need to destroy the tanks depends on where you hit them. If you hit them on their left or right sides it usually doesn't take more than two shells. 0:26 - I didn't use clipping. This passage is so short, it won't save any time. 0:38 - I'm walking a bit forward and backward. The reason is that there's an enemy behind me and sometimes he came so close to me that for some reason I hit him with the bazooka as if he was staying in front of me and then I died. The most difficult part in this level was to try to not get stuck at every single corner. Especially the doors at 0:15 and 0:47 were really annoying. 1:05 - The low framerate made this part quite difficult. 0:10 - Killing this guy is faster than just waiting for him to get out of my way. And I get an extra clip of ammo. 0:19 - I should have not killed that guy. 0:55 & 1:04 - There are three ways to get through the doors: Show your ID, kill the guys or lure them away from the doors. The third method is the fastest. Shoot next to them to get their attention. They will now try to kill you but they will also stay on their position. But if you get out of their sight by hiding behind the corner or something else they will follow you, and it seems like the level was designed the way that the doors automatically open if the guards are away. The same happens if you kill them, but that's slower because that way you have to wait until they completely disappeared. 0:20 - I had many failed attempts because I didn't photograph the secret codes on the first attempt. It seems like looking in the wrong angle causes that, even if the codes are definitely on the camera's focus. 0:35 - I have no clue how this trick works. I found it on accident. My guess is that the door somehow pushes me through the wall after destroying the lock. It's not too difficult to perform this trick. 0:45 - You can jump directly from up here onto the truck. But the large distance in combination with the low framerate makes this jump more difficult, so I decided to not do that. 1:06 - You can clip through here, but it doesn't save time. By the way I found a way to clip from the place at ~0:55 to the place with the last two trucks, but it's extremely slow. 1:24 - I had to wait until the last truck exploded. Making sure to destroy each of the three bunkers with one grenade was the most difficult part of this level. 0:52 - Sometimes I got stuck at the stairs because of the low framerate. 1:00 - Sometimes this door was still closed, even if I activated the landing lights. PS: I wonder why they need me to destroy the bunkers anyway. It takes the allied airplanes 1(!) second to land or to do an airstrike after a bunker is destroyed. If they're that fast they should be able to avoid bunker attacks. In case you don't know what these blue guys are, they're pirates and they're my and the Nazi's enemies. There is a way to clip yourself from the beginning of the level to the market place that I am at 0:38. But again, it's really slow and I had to backtrack to pick up some papers that I need (the ones I picked up at 0:24). 0:13 & 0:46 - Often there's a guy there blocking my way, but I was lucky and he didn't appear (fast enough). That's also the reason why I'm shooting here, in case they would appear. And by the way, this is probably the easiest or one of the easiest levels in this game. You will take almost no damage at all, even if several people are shooting at the same time at you. It took me a while to find a good strategy for this level. I'm very low on ammo here, so I had to plan that in. There are 9 or 10 archaeologists but you have to kill only 8 of them, no matter in what order. I have to save health at the first half of the level, which is the reason I'm killing more guys there and why I'm trying to prevent them to not start the alarm. 1:00 - The door didn't appear. First I thought I had no influence on whether this happens or not. But then I found that if you're looking closer to the wall and not too far into the door's direction the chances are high that it will not appear. 1:15 - After finishing the run of this level I found that there's a way to use the vase to clip through the fence. But it doesn't save much time and furthermore it seems to lower the chances that the door and the enemies at the end of the level won't appear. 1:20 - Looking to the right prevents the door and the enemies at the end of this level from appearing, but the boxes I have to destroy will be there. Very convenient! 0:11 - I'm picking up grenades (I need a grenade to destroy one of the guns at the end of this level) and I shoot at one of these oil lamps to destroy the equipment. 0:40 - Again, not looking too much to the right prevents a door from appearing. 0:50 - I have to enter the bunker on the left side of the door, otherwise it might happen that I don't hit the trigger that marks the objective "find the bunker" as completed. 0:56 - Yes, empty weapons ARE that powerful. 0:07 - Normally there's a guy on this bridge, but he didn't appear. 0:16-0:25 - Sometimes you take a lot of damage during this part. 0:38 - I didn't kill these guys, because leaving them alone prevents several guys from appearing at 0:43. There might be one guy here, but otherwise there are two or three of them. 0:41 - Picking up an StG44. 0:51 - This shot is very difficult. The crossbow takes a lot of time to reload and even "fast reload" (quickly changing the weapons; they will reload automatically) doesn't help here. And the two guards do a lot of damage to me and I need enough health for the next part of the level. Originally I used the StG44 but it wasn't accurate enough. Unfortunately there are no grenades in this level. If you would throw a grenade on this little house the explosion would destroy the radio through the roof. This level is easy if you just play through it, even on hard difficulty. But running it is really annoying. There are many places where you can get stuck and you have to perform a lot of clipping glitches. 0:57 - You can jump over the table but I decided to not do that. It won't save time and many attempts were ruined when I tried to do that and didn't succeed. 1:09 - I tried to fall through here but it's very narrow and in most attempts you will grab the ladder. 1:16 - I'm luring the knight to the safe and try to use the explosion to kill him (which didn't happen here; but it doesn't matter) while picking up a med-kit. 1:38 - I can't strafe-run along this last part of the stairs. 1:49 - Luckily I didn't get stuck here, which happens very often. 2:05 - I've found Valhalla, LOL! 2:06 - Jumping over this circle is very difficult. If you get in there it's surprisingly hard to get out again, especially when a bunch of guys are shooting at you. PS: IIRC this castle really exists, I'm pretty sure I've seen it on TV. PPS: Nazi symbols are removed from this German game version, but they forgot to remove them from this mission's picture gallery. In fact the gallery pictures were all leaved untouched, they're not even translated. 0:53 - I need a grenade from that guy for a trick later in this level. IIRC there are only two guys that leave grenades if you kill them, this one and another guy who is off my way. 1:18 - When doing a melee attack the picking-up-stuff radius around you gets bigger and even allows you to pick up med-kits through a wall. By the way, you can also hit enemies through walls with a melee attack. 1:21 - I was throwing a grenade to distract the enemies, so I won't get too much damage. 1:30 - The explosion of this grenade destroys the sirens through the roof. Otherwise I had to enter the house and destroy them. There is a method to clip though the bush to get back to the street without having to walk back the whole way, but throwing the grenade on the house and backtracking the short way is faster. There's also a third method, you can jump on the bush from the main way and throw a grenade on or next to the house, but it's very tricky and probably doesn't save any time at all. 1:54 - I had to wait until the game loaded the textures here to continue. 2:26 - I got a bit stuck here but I had to wait for the game to load the textures to continue anyway, so didn't lose any time at all. My goal was to destroy each truck with only one shot to save time. 1:04-1:07 - You can see that two guys spawned on top of the truck. One guy survived, the other died. 1:18 - I didn't destroy the barrel on the left side. But the grenade that one of the enemies threw seemed to destroy it for me. You can't really speed things up in here. Make sure to kill everyone, so the captain doesn't have to do that. 0:09 - I was just shooting and didn't care if I hit the captain. This is the beginning of the level and if that happened the level would just restart. 0:27 - That was precisely timed. Throw a grenade after the "Captain freed" message pops up. 0:50 - Killing the prisoners doesn't really speed things up. But since the game can't handle more than a certain number of characters this will let the next waves of enemies appear faster. So it kinda helped me to estimate when certain enemies will appear. And I thought it was funny, because it somehow obsoletes the idea to free the prisoners. However, your objective is only to free them, so it doesn't matter what happens to them after that. 1:25 - I have to follow the captain, otherwise he won't begin to open the door. 1:59 - I think I got into his way but it didn't stop him for longer than a few split-seconds. 2:11 - If you look closely you'll see that this guy appeared right at the moment I arrived there. 2:27 - That grenade was meant for two guys that appear there. 2:56 - I have to wait here until the captain freed the last prisoner. If I walk too far forward the game won't register that. 3:11 - I picked up new bazooka shells for the next level. 0:14 - I restarted the level if I didn't destroy the car with two hits. 0:48 - I didn't realize that I can't destroy the rest of those boxes that way fast enough and therefore lost a second. 0:54 - Two guys that would block my way didn't appear here. 1:06 - I destroyed all the boxes here with two shots. Sometimes it took me three or four. 1:33 - Same here, tried to get the car with two hits. I tried to not lose too much health at the beginning of the game (until I meet that guy who gives me the factory plans). 0:18 - I had to kill that guy, otherwise he'll do a lot of damage to me. Performing the "looking up/down" trick I've used in the last two levels would've saved some time here, but I wasn't able to improve the time of this level afterward (one of the reasons is that navigating is very hard). 1:06 - There seems to be an invisible wall in the air that prevents me from U-jumping around that (visible) wall. 1:49 - I was walking forward and shooting because usually a guy appears there who will shoot at me and make it hard for me to climb up the ladder. 2:28 - This jump saves a few seconds. It can be very difficult, especially with low framerate. That's also the reason why I turned off the music in this level, because that seemed to reduce the lag a bit (though I'm still unsure how much influence that has on lag). This is the level I've been doing the most speedrunning attempts on. It's very long, the enemies are stronger than on most other levels and there are several things that can go wrong where you have no or not much influence on. This run might not be perfect, but believe it or not it's very fast. Music was turned off. 0:11 - Sometimes that guy with the key is waiting for me at the end of this hallway, but that barely ever happens. 0:30 - This clipping glitch allows me to skip a trigger area at the other end of the vent. That area triggers the game to load the door of the first engine room. By clipping around that area I can start to blow up the engines in this first room, which saves a lot of backtracking. I'm using the med-kit you can see after 0:33 for orientation. After it's out of my FOV I can start to clip back into the level. 1:02 - Picking up the med-kit was probably unnecessary but health was so much of an issue in this level that I always picked it up. 1:11 - Yes, he was blocking my way, but sometimes even more than only one enemy does that. 1:37 - That was supposed to stop the enemies from following me for a while. 1:48 - Very often I was not able to get up anymore after ducking here. I'm not quite sure what the reason of this was, it seemed as if it might had something to do with the enemies at 1:30. 2:07 - I was waiting here to make sure the game registered all the explosions. That was a real issue when I was speedrunning this level. 2:58 - If I was planting the bombs too fast it might have happened that the game didn't register the last explosion. So I'm doing it a bit slowly here. And that's why I'm waiting at 3:10. 3:13 - Very often the game didn't load that elevator. 3:40 - I was so low on health, I had to pick up this med-kit. 3:47 & 3:51 - Distracting the enemies. 4:03 - Sometimes the game didn't register that explosion and I had to restart. I think this is the level that started the whole rail-shooter levels tradition in MoH games. I'm very satisfied with the start. The rest is very simple, I'm trying to not lose too much health during the rail-shooter parts and I'm doing the bomb-planting parts as fast as possible. By the way, I kinda love the level design of the rail-shooter parts. The graphics might be old, but it feels very realistic to me. 0:10 - There's another place where you can pick up the Molotov cocktails too. But it's off my way. 0:13 - I'm doing a light version of the "looking up/down" trick. At the time I was running this level I wasn't sure if that really helps or not. 0:58 - I took cover here from the explosion. 1:18 - The boxes didn't appear. 1:23 - I have to kill everyone who is or was standing in that last area. 0:06 - I know, they're my resistance friends, but if they block my way I kill them. 0:09 - I had so much trouble with that guy. Depending on how fast I started this level that guy was either hiding behind the corner, like he did here, or blocking my way. 0:30 - It looks like I lost time here, but it takes some time until the third enemy appears. I had too many attempts ruined because I threw the Molotov cocktail too soon. Here I threw a second one to make sure I killed him. 1:07 - Unfortunately you can't do the vent clipping glitch here. 1:28 - Sometimes this motorcycle doesn't appear. 2:03 - Got a bit stuck here. On the last barricade there are four and not just three enemies that you have to kill. Music was deactivated for this level to reduce lag and prevent sound errors during the airstrike part. 0:06 - I was low on StG44 ammo, so I needed to take it from this guy. 0:10 - I've picked up bazooka shells, but the game didn't realize that ("find the bazooka" is one of my objectives here). 0:18 - I made sure to destroy the first and third tank with only two hits each. The second one takes more, because of the angle I'm shooting at it. The front of the tanks can take more damage. 0:29 - Here the game realized that I've found the bazooka. I have to take this little detour to pick up more shells and refill health. 0:44 - I did that on purpose. If you destroy that tank fast enough you can use him to jump over the barricade. 0:52 - You really have to time this and know when you can run, otherwise you might get killed. 0:59 - That wasn't really necessary. 1:04 - I got a bit stuck here. The enemies in this level can be really tough. And there are many edges you can get stuck at. I often screwed up the jumps throw the windows. I tried to get out of the room at the end of the level. It's possible but tricky. PS: I'm sure this train is technically not moving. This is definitely the easiest level of the whole game. Dogs don't do much damage at all and the few enemies here that are equipped with weapons either don't appear or they don't appear fast enough when you're just running through the level. The most difficult part was actually to make sure the dogs are not blocking my way. PS: I wanna know on what drugs the developers were when they came up with the idea of the last three levels. Dancing dogs, exploding green aliens (?) and Nazi robots that look like nut crackers but are called "safe crackers"? And all this during WWII? Formerly the most difficult levels those two became very easy with the "looking up/down" trick. For orientation reasons and to be able to move faster I'm not looking up the whole time in the last level. There's a run of the last level where I was not using the "looking up/down" trick (http://youtu.be/BffYK6HNFIQ). But I've beaten that time since that attempt was full of small mistakes. And doing this trick makes it much more reliable to beat this level. In fact you can easily single-segment the whole last mission on hard difficulty using this method.